72mm KENKO NDx8, Smart Slim Neutral Density Filter. 1x filter. However in case of an problems I'll do my best to solve any issues. 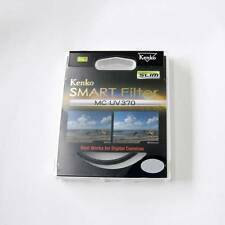 Kenko Smart Filtre U.V Slim 49 mm,49 mm,U.V - Slim,Filtre Vissant. Important: nous ne livrons pas dans les îles, colonies et les autres terroirs au-delà. Nous ne pouvons pas fournir d'assistance technique spécialisée. Ultra-Violet (UV) rays, although invisible to the human eye, give a bluish cast in colour photography. This filter effectively eliminates UV light of wavelengths shorter than 370nm. No exposure compensation is necessary using this filter making it ideal as a permanent protective filter. The Kenko Smart ND8 filter has a slim 4mm ring and will accept a lens cap. Includes hard case. Rest of World United Kingdom. 62 mm,Polarisant - Slim,Filtre Vissant. Important: nous ne livrons pas dans les îles, colonies et les autres terroirs au-delà. Nous ne pouvons pas fournir d'assistance technique spécialisée. The Kenko Smart ND8 filter has a slim 4mm ring and will accept a lens cap. Auctiva's FREE Counter. Includes hard case. United Kingdom. 72 mm,Polarisant - Slim,Filtre Vissant. Important: nous ne livrons pas dans les îles, colonies et les autres terroirs au-delà. Nous ne pouvons pas fournir d'assistance technique spécialisée. Kenko 382936. Taille de filtre: 8,2 cm,Type de filtre: Filtre de protection d'appareil-photo. SIMPLICITÉ ET SÉCURITÉ. Kenko 339930. Taille de filtre: 3,9 cm,Type de filtre: Filtre de protection d'appareil-photo. Quantité: 1 pièce(s). SIMPLICITÉ ET SÉCURITÉ. Kenko 377970. Taille de filtre: 7,7 cm,Type de filtre: Filtre de protection d'appareil-photo. SIMPLICITÉ ET SÉCURITÉ. La performance ajustée conçue nouveau filtre cadre de coût élevé,La plus haute série de filtres de qualité que nous avons développé pour les mondes,Taille du filtre: 52mm. SIMPLICITÉ ET SÉCURITÉ. Polarising filters achieve their greatest effect of eliminating glare when used at a 30-40 degree angle to a reflective surface (like glass or water). This is also caused by light polarization. Using the polarizing filter will help to greatly reduce the softness caused by atmospheric haze. 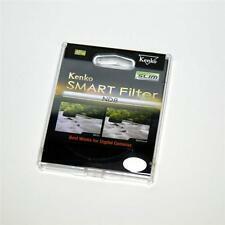 Kenko Smart Filter Kit consists of 3 filters: Protector, Circular PL and ND8 that belong to Kenko Smart filter series. Kenko Smart Filter Kit is specially designed for beginners and amateur photographers as a initial set to start. The Kenko Smart ND8 filter has a slim 4mm ring and will accept a lens cap. Includes hard case. United Kingdom. SMART FILTER diamètre 52 mm PROTECTOR SLIM MC filtre KENKO. FA KENKO FILTRE. MC filtre 52 mm diamètre SLIM SMART PROTECTOR. This filter reduce the amount of light entering the lens so wider apertures can be selected. Reduce the amount of light. FAMILY RUN SINCE 1954. This effect is often used to increase the contrast and saturation in blue skies and white clouds. Kenko's CPL filter do not affect the overall color balance of a shot. The glass of the Kenko Clear PRO CPL UV Absorbing filter also has UV absorbing properties making the Clear PRO a combination UV/circular polarizing filter. The Kenko 77mm Smart Filter MC UV370 Slim filter effectively eliminates UV light of wavelengths shorter than 370nm. No exposure compensation is necessary. The best use of this filters is for scenes such mountains, beaches, areas of snow, and any other situations where there is a lot of UV light present. MC filtre 55 mm diamètre filtre SLIM SMART PROTECTOR KENKO. FA KENKO FILTRE. MC filtre 55 mm diamètre SLIM SMART PROTECTOR. Filter Accessories. This filter reduce the amount of light entering the lens so wider apertures can be selected. Reduce the amount of light. Tripod Accessories. Tripod Heads. Produce Motion Blur. Tripods & Monopods. Best option of good quality and affordable price for those who just starting to shot. FAMILY RUN SINCE 1954.